GM's sales fell 10.8% in 2008. GM sold 610,000 fewer cars than Toyota, making it the first time in nearly 80 years that GM was not top in global sales. NEW YORK (CNNMoney.com) -- General Motors lost the title of world's largest automaker to rival Toyota Motor in 2008, according to sales figures released Wednesday by the troubled U.S. automaker. It was the first time in nearly 80 years that GM did not sell the most cars in the world. GM (GM, Fortune 500) reported that global sales plunged 10.8% for the year to 8.36 million vehicles. That allowed Toyota (TM) to move ahead of GM with sales of 8.97 million vehicles worldwide. GM executives tried to play down the significance of the company losing the title it had held for 77 years. "I don't think being No. 1 in global sales means much at all to the average consumer," said GM sales analyst Mike DiGiovanni during a conference call Wednesday. "What matters most to the consumer is strong brands and strong products." A spokesman for Toyota also downplayed the shift in the global sales leader title. "Being No. 1 in volume has never been our goal. Being No. 1 in quality and customer experience has been our goal," said spokesman Steven Curtis. DiGiovanni said GM is much more focused on stemming losses in its auto business and proving that the company can be viable for the long-term. The company was in danger of running out of the cash it needed to continue to operate last month before it received approval for $13.4 billion in loans from the federal government. GM has until Feb. 17 to provide the government with a long-term plan to remain viable or it risks having to repay the loan. But for the short-term at least, there are no signs that sales will improve anytime soon. DiGiovanni said that the seasonally-adjusted annual U.S. sales rate will fall below 10 million vehicles in January. That would be the first time below that benchmark since 1982. Industrywide U.S. sales came in just over the 10 million sales pace in each month of the last quarter of 2008 despite a sharp plunge in demand that left sales down 35% from year ago levels. Investors seemed concerned by the bleak outlook. Shares of GM fell 2% Wednesday morning even though the broader market rallied following Tuesday's big plunge. DiGiovanni attributed the new low for U.S. industrywide sales to a sharp drop in fleet sales to businesses, such as rental car companies, rather than further weakness in consumer sales. He added that the decision by GM, Chrysler LLC and Ford Motor (F, Fortune 500) to trim first quarter production due to weak sales is leading to the drop in fleet sales, and that retail sales should be at or slightly above sales seen in the fourth quarter. DiGiovanni said the company is hopeful that economic stimulus plans being considered in the United States as well as in other nations should hopefully help sales later this year. But he cautioned that "2009 will be a very difficult year." GM's sales in Europe fell 6.5% while sales in North America plunged 21%. The company did post full-year sales gains in its Asia-Pacific region, as well as in its Latin America-Africa-Middle East region. The loss of the No. 1 automaker title came as no surprise. 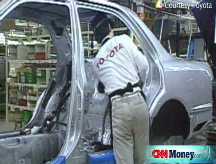 Toyota finished 2007 only 3,101 vehicles behind GM, as its sales rose and GM's fell that year. But Toyota's sales fell 4% in 2008 as all automakers were hurt by high oil prices earlier in the year and the global recession. Toyota has already said that, due to the sharp drop in global demand for autos, it will report its first operating loss as a public company during its current fiscal year. Toyota's sales declines are a more recent problem, however. GM has been losing market share in the U.S. to Toyota and other import brands for decades. Still, DiGiovanni would not concede that Toyota will hold the No. 1 sale title for the foreseeable future. He pointed out that GM is still ahead of Toyota in sales in the United States and Western Europe, the two markets most hurt by the global recession and credit crisis, and he pointed out that GM is also ahead of Toyota in many growing markets, such as China, India and Brazil.